If you are not used to keeping track of your inventory at all, the chances are that you’ve subjected yourself to many errors and challenges. Although inventory counting is a good business practice, many businesspersons often treat the task as burdensome, hence unnecessary. You can also see Fact Sheet Templates. However, failure to keep an inventory check can break your business; maintaining an inventory count has numerous benefits to business, and, as such, you cannot underestimate the practice. 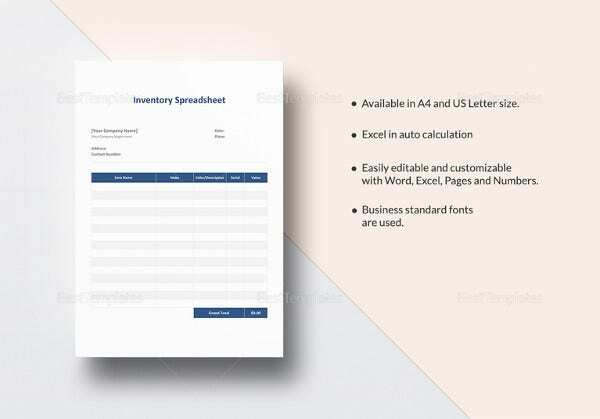 Following are the best inventory count Sheets Templates that you can use to make the process of stock management easier. 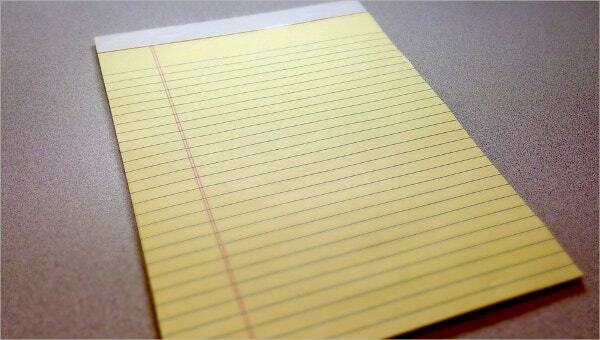 It is impossible to know the exact number of your stock if you don’t have a count sheet. 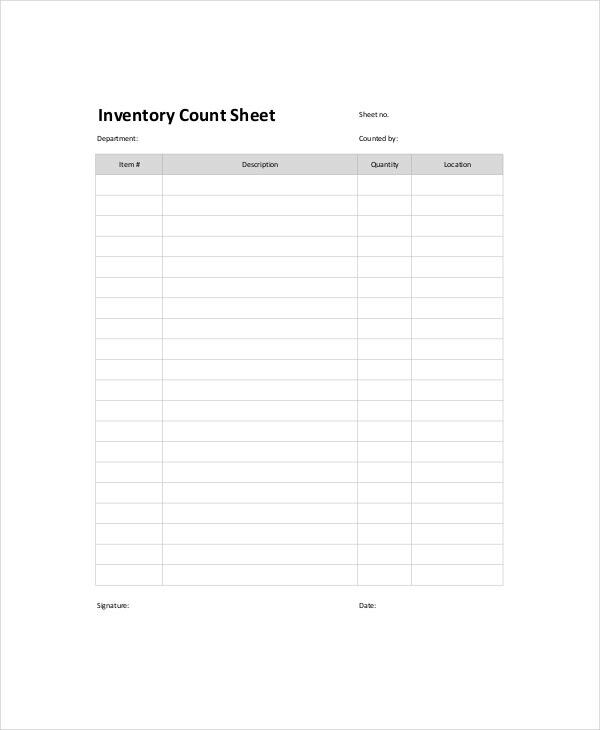 With this template for inventory count, you can keep a record of your entire inventory. Moreover, you can edit the list to keep your inventory up-to-date; an updated inventory enhances consistency and accuracy. 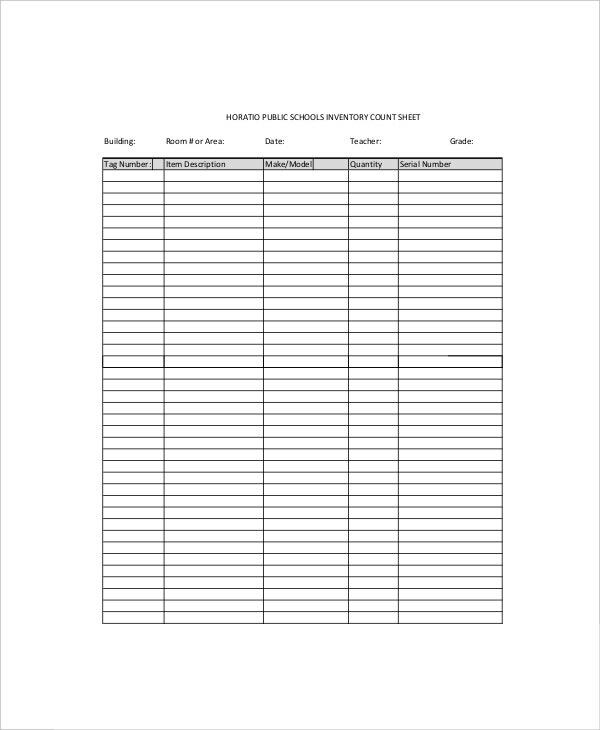 You can also see Sign Up Sheet Templates. 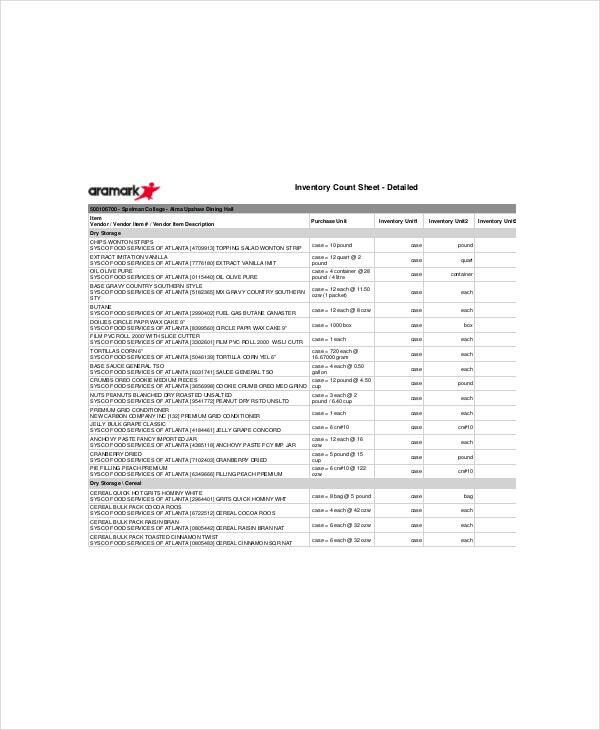 This template can help you save a lot of time and money by enabling you to keep an exact count of your inventory. 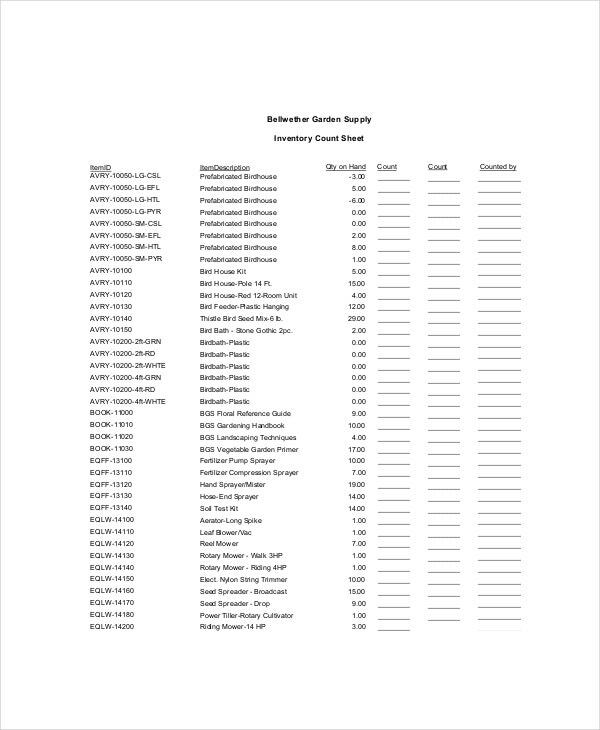 With the exact number of items on paper and in a document, you can know which products to order and those that are still in stock. As such, you will spend money only on the items that are necessary. Moreover, you are never going to waste or spend any money on slow-moving products. Counting inventory off the top of your head is silly because the process is usually tedious. It is also prone to errors because it is inaccurate. 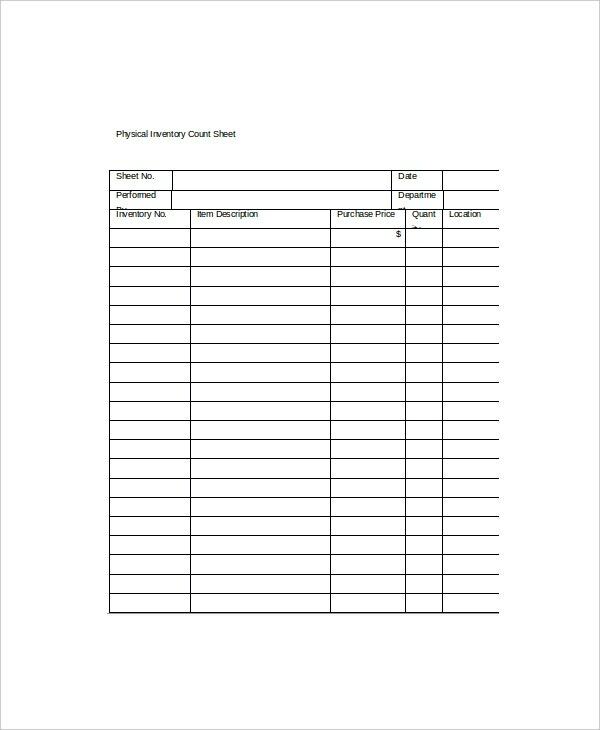 This template, however, helps you to keep a good record of your inventory, for it helps you maintain the count of all items without making an error. This template will help you to increase the efficiency and the productivity of your business. By writing down an accurate list of the current inventory as is, you and your team won’t have to worry about missed items or an exaggerated list of products. You can also see Job Sheet Templates. > What are the Benefits of Good Inventory Management? The right inventory order is a highly optimized list, and the reason why you should be keeping one is that you don’t want to keep excess stock or less than you should. A good practice of professional inventory management, therefore, is to make sure you prevent shortages of products by keeping just enough in the store. You can also see Contact Sheet Templates. Businesspersons who don’t have organized warehouses often have a hard time tracking their inventory. It is likely that some people don’t usually care until they notice that their stock lacks organization. Of course, lack of organizing alone can get you confused, so the best thing to do is to make sure you count your inventory regularly to keep your warehouse in order. > What is the best Inventory Counting Approach? Inventory counting seems to be somewhat a difficult job for many people. That is usually because some businesspersons often wait for too long before they can update their list. As such, the task of counting an inventory becomes fully burdensome and ridiculously overwhelming. Stop pressing yourself in a tight corner by waiting for too long before you can count your inventory. Instead, use an approach called Cycle Inventory Counting. You can also see Grade Sheet Templates. > What is the significance of Cycle Inventory Counting? Cycle Inventory Counting is a simple approach that you can use to manage your inventory. It is about counting a part of your inventory every day according to the specific schedule prepared by you or the warehouse managers. Advantages include improved productivity and expeditions, reduced management time, and zero pilferages. 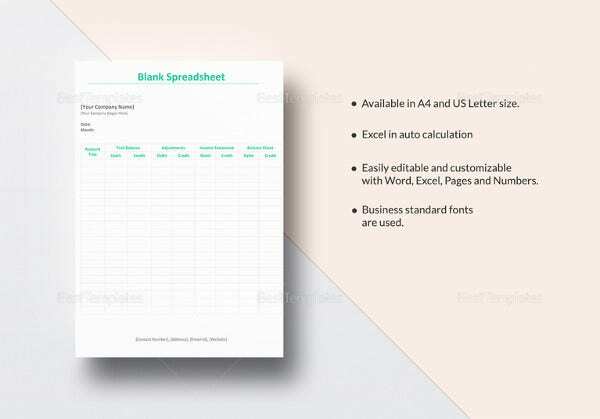 You can also see Expense Sheet Templates. 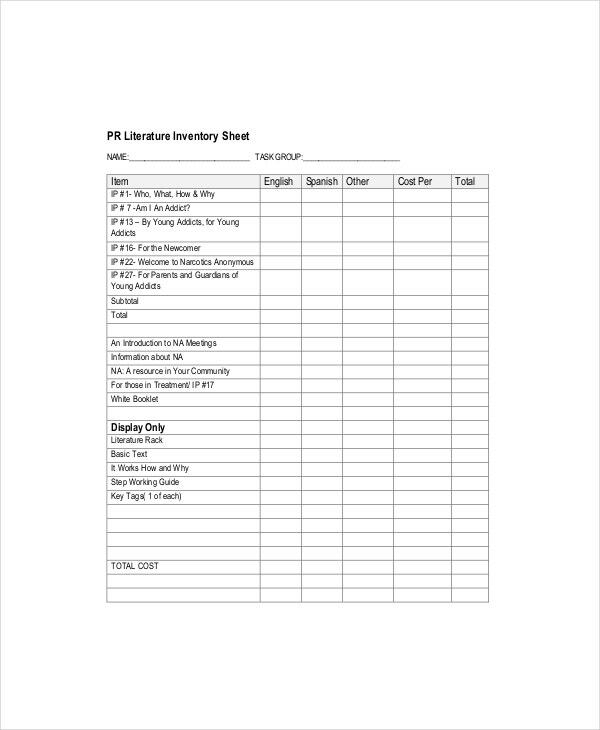 Inventory count sheets are free to use and easy to customize. As such, you don’t have to spend much of your time creating a fresh template on your personal computer. Because the templates are easy to edit, feel free to personalize the design although you can use the model as is.